Split pea, spinach & cauliflower soup. Comfort-a-rama. It’s Saturday lunch time. Pouring with rain outside and the beach looks wild. Whilst the youngest of my team are eating vegemite sandwiches, it’s time for me to cook soup. For myself. I’ve been saving a beautiful chicken stock in the freezer that was made from an exceptional roast chicken. It’s time to pull that out, and have a hunt and gather session in my fridge. I have no interest in shopping – so the soup must be made with whatever I can find. 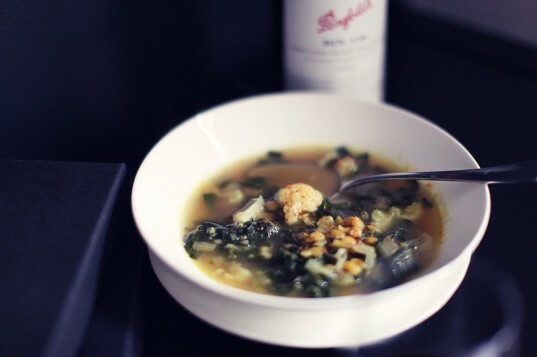 After a quick fridge audit and a scan through my favourite cookbooks and sites, I came up with this soup. 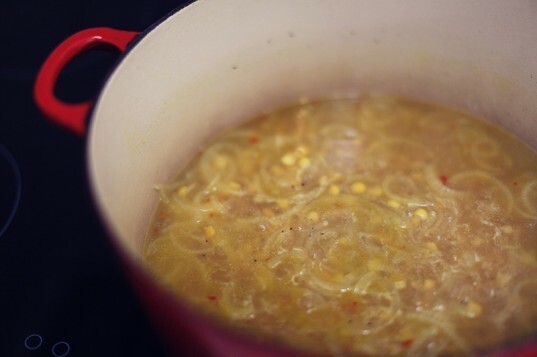 It’s inspired by a hybrid of this soup featured on 101 Cookbooks (one of my favouritist all time sites), and a random newspaper recipe – of which I have no idea about it’s origin or author. 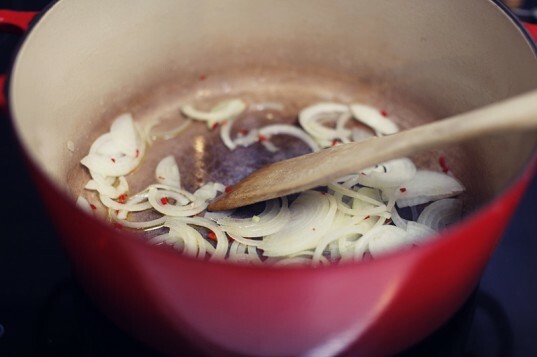 Crank up the stove and heat the oil in a large, thick-bottomed soup pot. Add the onion, chilli and celery, and cook until they soften. Then add the spices and cook for another minute or so – keep stirring so they don’t burn. Then stir in the stock. Bring to a boil and add the split peas/lentils to the pot. Cook until they are just tender, about half an hour. Then add the spinach and cauliflower. Cook for about 20 minutes. You may need to add some extra stock or water if it gets too dry. Serve ‘er up, and when when you’re ready to eat, add the coriander and dill, and adjust the salt & pepper to taste. Dust over some chilli flakes if you want more heat. Dial the storm up a notch and tuck in. Previous postSlow cooked lamb shanks Next postJust because.